Today is the day! All of the new December products from My Favorite Things are for sale - right now! Check out the Brand Spanking New section of the MFT Boutique. AND to make this day even sweeter, we have some free goodies for you! Visit each of the MFT Designers' December Product Launch posts linked on the MFT Blog and leave a comment by the end of the day on Thursday, December 12 for your chance to WIN one of 20, $10 Gift Vouchers (that's $200 in prizes - NICE!). The winners will be chosen at random and the prizes will be sent out on December 13. One prize will be given away from each of the designers' blogs, as well as one from the MFT Blog. Ready? Set. Comment! To get things started tonight, I have a couple cards for you showcasing the new Cheers Glass Charms Die-namics. 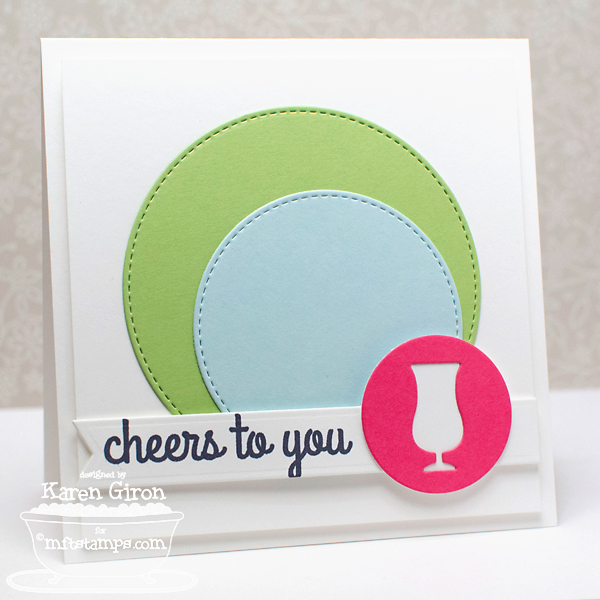 My next card features the Cheers Glass Charms Die-namics again, but I used the charm as the focus. I used a couple Stitched Circle STAX Die-namics in Sour Apple and Sno Cone Card Stock and then cut out the glass charm in Razzle Berry Card Stock. I popped the charm up over the sentiment with foam tape. The layout here is Retro Sketches RS#93. Be sure to stop by the MFT Blog for a complete list of all designers and then don't forget to comment on each blog to win your prize! 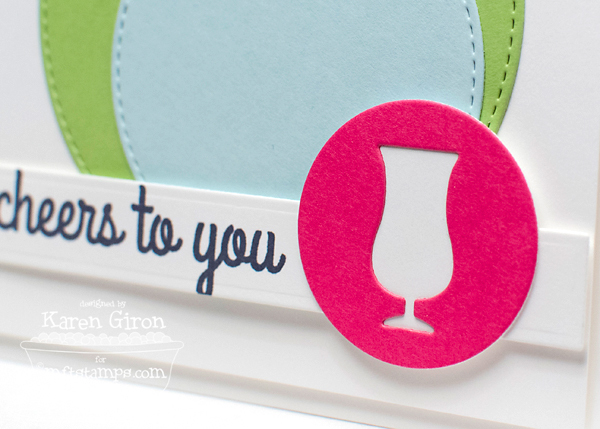 Great cards - love that color combo! Love the bright colors with all that white space! Awesome! Wow, love the color combo & the card inspiration - Thank you! I just love that font! It really stands on its own on CAS cards! Yup!!! I am buying that die set now! 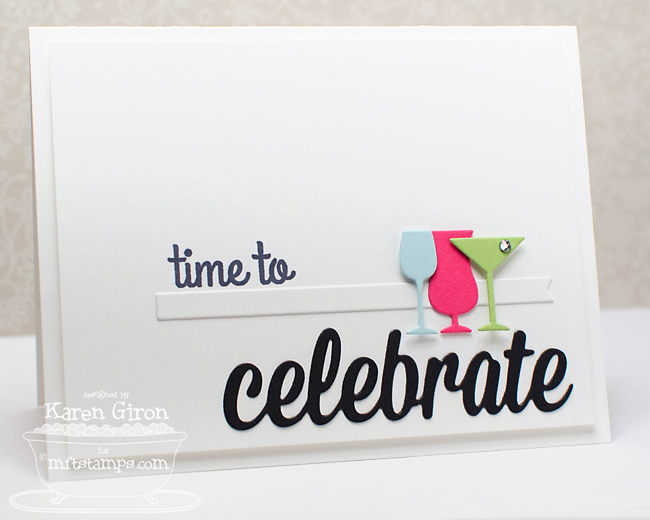 Love how you used the positive and negative elements to make two cards! Fabulous! So simple and yet so totally FAB!! Wonderful cards! Love the colors you used. Great! I know now what I want Santa to bring,,,,,,,,,,,Stunning! the small celebratory charms are adorable and I love how you used them. love the color combos you used on your cards. I love how the stitched circles look with the glass charms circle! I can't get enough of the stitched circle dies and those colors are just so wonderful! Love them! The stitched circle STAX is my fave ... just love it! Visiting your blog is always so inspiring! love the stitched circle dies! Awesome cards! 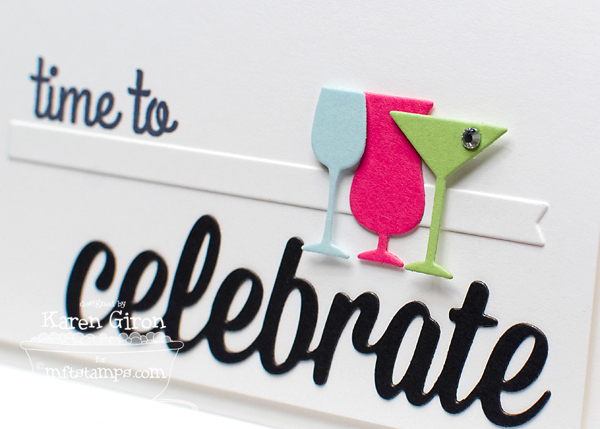 Love the new stamps & dies! Thanks for all the great inspiration. I enjoy your work.